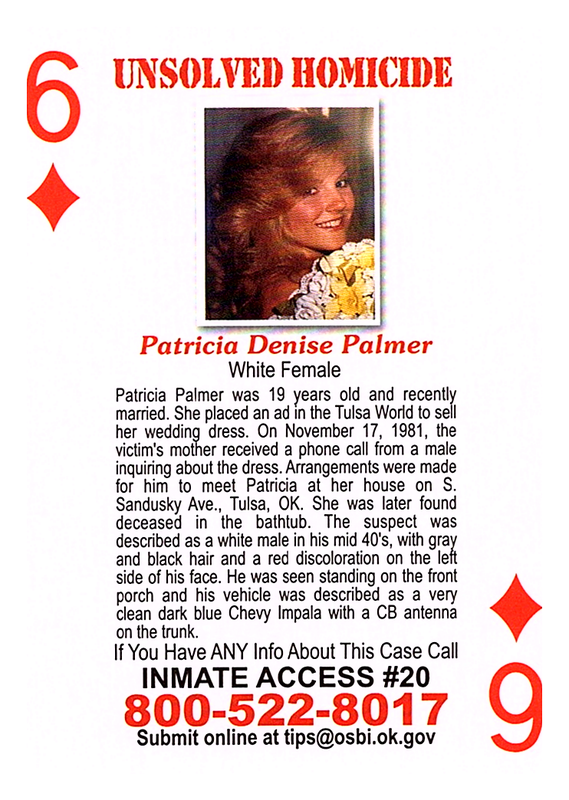 Patricia Palmer was 19 years old and recently married. She placed an ad in the Tulsa World to sell her wedding dress. On November 17, 1981, the victim's mother received a phone call from a male inquiring about the dress. Arrangements were made for him to meet Patricia at her house on S. Sandusky Ave., Tulsa, OK. She was later found deceased in the bathtub. The suspect was described as a white male in his mid 40's, with gray and black hair and a red discoloration on the left side of his face. He was seen standing on the front porch and his vehicle was described as a very clean dark blue Chevy Impala with a CB antenna on the trunk.